As kids, mum would take us to the ballet once a year. I distinctly remember watching Swan Lake and wishing they would slow down so that I could take every dancer in, that I could appreciate them individually for their talent and I wouldn’t miss a thing. This same feeling returned at the fourth installment of WASO at the Movies for Harry Potter and the Goblet of Fire. It’s probably one of the nerdier events that I’ve attended but I welcomed that wave of childhood nostalgia with a heightened excitement. As soon as you walk through the doors to the convention centre, A Professor Sprout and Professor Snape are telling you to “be on your way now, or you’ll be late to class!” School outfits and wizard capes donned by the punters themselves just added that extra touch of gold to an already magical start. Considering this was the second night, it was a full house of eager witches and wizards. 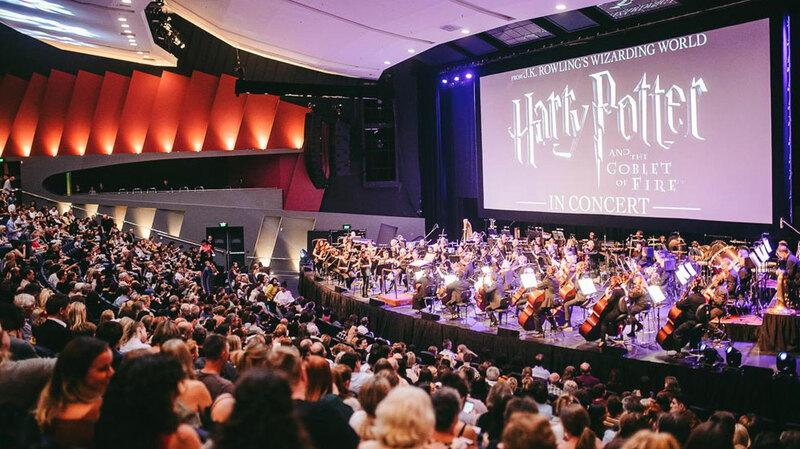 Those sat waiting saw the West Australian Symphony Orchestra looking dazzling as Nicholas Buc, their conductor, sprang onto the stage with as much charisma and charm as Gilderoy Lockhart. Smoothly and swiftly the film began and so did the music. Usually reviewing gigs I’m used to support acts and changeovers and that gradual build to what you were coming to see but this launches straight into a very dark and foreboding scene of clouds and a way more sinister introduction into Hedwig’s Theme. Whether this was due to the change in composers from the beloved John Williams to Patrick Doyle or purely the maturity and change of the Harry Potter novels, there was much more of an ominous and black undertone. In contrast to these darker scenes, Doyle creates beautiful upbeat, festive, folk-like pieces for scenes like the Quidditch World Cup, which is where I struggled to choose between watching the rhythmically feverish violin bows, the firework displays and flying broomsticks on the big screen, or reading the captioned dialogue; it was a sensory overload! In between the music, the crowd booed and cheered accordingly for the appearance of their favourite characters and laughed uproariously to cute coming-of-age moments. As Harry faces many a challenge at Hogwarts for the Triwizard Tournament there are new characters (Mad-Eye Moody, Rita Skeeter, Krum and Fleur) that bring about new introductions with creepy or mischievous, or brazen and delicate overtones. The complete set of works is filled with beautiful, calming harp melodies, huge trumpet centred anthems or dark and brooding string sections – a truly wide variety. Perhaps the best part was where in the movie, the grandstand band start playing for the final challenge which just tends to fall apart, as the orchestra with its tubas and trombones were able to exactly represent that hilarity of a school band not quite being in time. My friend commented at the interval that she’d forgotten the orchestra was there at times but was wondering why she felt so emotional and for your everyday Harry Potter fan that’s exactly what it gave you. A heightened sense of the feeling and the passion that just sweeps you away into the mystical magical world of Harry Potter. Can’t wait yet again for another night of WASO at the movies.